Clunn Wins At St. Johns Again! 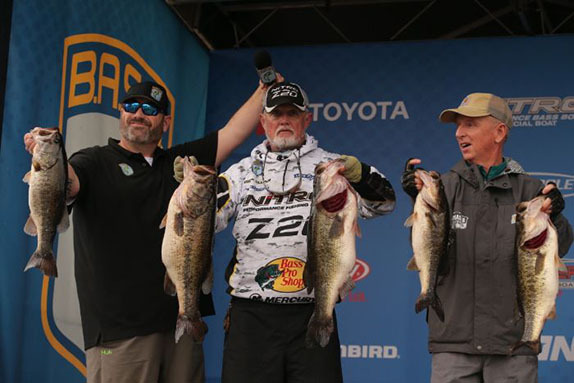 Rick Clunn's 34-14 stringer on the final day of the St. Johns River Bassmaster Elite Series gave him his 16th career B.A.S.S. victory. 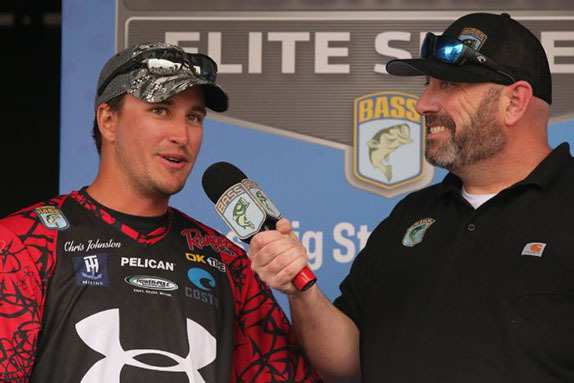 When Rick Clunn won the 2016 St. Johns River Bassmaster Elite Series, many BassFans looked upon the achievement as the last big hurrah in one of the greatest careers ever fashioned with a rod and reel. Clunn, now 72 years old, did it again today. The four-time Classic champion dropped a tournament-best 34-14 bag on the scale in Palatka, Fla. that bumped his four-day total to 98-14. That was enough to achieve his 16th career victory in an epic season-opening shootout that featured five 30-plus-pound stringers over the final two days. "The only thing that would make this as good as last time is this time my family's not here," Clunn said on stage as he was handed his trophy. "All fishermen know the sacrifices that have to be made, so I'd like to thank (wife) Melissa (and children) Sage, River, Brooke and Cortney. "I almost lost the tournament on the first day when I left (his primary area) too soon � we had a perfect storm with these fish. I knew I had to step it up today; I knew I had to catch two giants, and I did." His bag contained a 9-14 monster and another just 3 ounces lighter. His tournament total, just 1-02 shy of the century mark, is the highest winning weight in any of the Elite Series' five visits to the St. Johns. Four of his five weigh-in fish on the final day were enticed by a 3/4-ounce Luck-E-Strike Trickster spinnerbait in the shellcracker color. His other primary bait for the week was an old-school Bobby Ditto Gatortail worm. "I knew I had to make the spinnerbait work today with the wind � one of the big ones missed it and I threw back with the worm and caught it. I only caught one or two a day (on the spinnerbait) on the other days, but they were all over 5 pounds, so I knew it was producing a good grade of fish." Chris Johnston, who'd begun the final day with a 5 1/2-pound lead, ended up 2nd with 95-02 after sacking 19-05 on day 4. Mark Menendez, who'd be considered an "old-timer" when stacked against anybody on the circuit other than Clunn, landed in the No. 3 position for the fourth straight day after a 25-12 bag pushed his aggregate to 95-01. Patrick Walters, a rookie from South Carolina who was fishing college derbies just two years ago, debuted in 4th with 91-14 (21-09 on the final day). John Crews moved from the bottom of the top 10 to fifth on day 4 with a 31-01 stringer for an 89-11 total. Lee Livesay, another rookie, headed up the second half of the top 10 with 88-10. He was followed by Clifford Pirch (88-01), Cory Johnston (85-06), Scott Canterbury (80-12) and Robbie Latuso (69-00). Chris Johnston didn't get the big bites on the final day that had carried him to the top of the standings after days 2 and 3. Johnston just didn't get the big bites that had carried him to the top spot in the standings over the previous two days. "I'm definitely disappointed, but it you have to lose to someone, you might as well lose to a legend who weighs in almost 35 pounds," he said. "He earned it today. "Every day I'd caught a fish over 7 pounds � until today. That bite never came; if it had, it might've been a different deal. I caught eight or nine keepers and the two biggest were both about 5 1/2." His primary locale may have succumbed to all the pressure it got � other anglers had caught big fish there after he'd left on day 3 and it had been hammered early that day buy a guide boat full of anglers employing shiner minnows. "If it had been sunny today, maybe there would've been some fresh fish around, but the spot can only take so much." Menendez admitted to having a case of "big-eye" throughout the day � he overestimated the size of his fish. "I just got so excited," he said. "I caught a 7-pounder when I was giving my cameraman (an electronics) lesson and I thought it was an 8, and then I went a ways down the bank and caught one that I thought was a 10 and it turned out to be an 8-09. I was just so stoked. "I'm a little upset about missing 2nd place by an ounce, which cost me $5,000, but that's the game we play. I was really pleased to be able to do what I did. I wasn't getting many bites � only five to 10 a day, and I was happy to be able to compete like I did." Walters slipped from 2nd to 4th on the final day (he'd caught a personal-best 32-15 the previous day), but it was nonetheless a superb coming-out party for the South Carolinian. "Words can't describe how it feels; I couldn't have scripted it any better," he said. "There's just been so much hype for so long and it was great to finally go out there and lay the meat to them." He had a 9-03 specimen among the 10 keepers he caught on day 4 � it marked the third straight day he'd boated one over 9. "I've never had anything like that on back-to-back-to-back days. It was an unreal tournament." Crews' 31-pound haul was headed up by an 8-12 brute. He went through about 18 keepers on the day. "It was pretty awesome, man," he said. "For one thing, it was just fun, and for another, anytime you can be on (the B.A.S.S. Live streaming broadcast) and catch a bunch of fish and move up five places, it's all good." The Elites will be back in action this week at Georgia's Lake Lanier. The tournament gets under way Thursday.